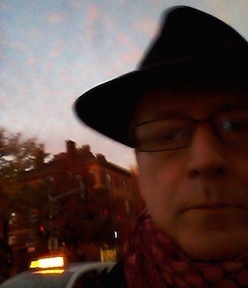 Anthologies of noir fiction seem to be popping up all over the place--after Serpent's Tail's London Noir there was a long dry spell until Akashic started its city noir series--and now there are duelling international noir anthologies. Serpent's tail has a Paris Noir and evidently Akashic is coming out with one too, following its succesful entry into the international noir anthology with Havana Noir. And Bitter Lemon has the excellent new Crimini, edited by Giancarlo De Cataldo, which differs from the other anthologies in that it's a translation of an Italian anthology, unlike the Paris Noir or Havana Noir titles, which were collections of newly translated pieces, brought together by the English-language presses. Whatever has caused this burst of anthologization, it's a boon for readers, giving glimpses of writers who are as yet untranslated as well as new stories by writers we are familiar with and writers who are just beginning their careers. Crimini meets the high standard set by Havana Noir (which I reviewed a couple of months ago. The editor makes the point in his brief introduction that one of the few common threads in the stories is the recognition of the new Italy's population diversity. In the first story, indeed, this diveristy is a source of much comic effect: Niccolò Ammaniti and Antonio Manzini "You are my Treasure Chest" achieves aa place in the very small group of hilarious noir stories, evoking one of the blackest of black humor tales, Terry Southern's Flash and Filigree, as well as Carl Hiaasen's Skin Tight. The second story is one of Carlo Lucarelli's Bologna-police stories, focused on a young female cop's dangerous dilemma, and it has a nervous energy even tighter than his novels. I'm a fan of Andrea Camilleri's Montalbano novels, but the non-Montalbano tale here is a bit of a disappointment, a five-finger-exercise, really, more than a fully fleshed-out story. Massimo Carlotto, on the other hand, manages to pack a whole novel's worth of plot and character into a story on the other side of the law from his novels that have been translated so far, which deal more with fugitives and with Alligator, his underworld detective, and his crew of misfit investigators. A cop whose wife wants to kick him out, whose female partner wants to get him into bed, and whose snitch has just been murdered pursues a Croatian gang of gunrunners. The ensuing mayhem is a fully realized noir novel in miniature, and quite different in tone as well as cast of characters from Carlotto's other translated works. Marcello Fois also contributes a tale that is quite different from the psychological thrillers he has so far been known for in English translation: his story is a police procedural and also the closest thing to a traditional mystery in this collection. His Inspector Currelli is almost Holmes-like in the end, though very much the noir detective (struggling against both criminals and the police bureaucracy) for most of the story. Most of the stories in the anthology by writers less well known in English-speaking countries are also fully realized and satisfying tales. The editor's own story is a whimsical romance masquerading as noir: the mix of Italian and immigrant characters is subtle, with villains and heroes/heroines in both categories. Teresa's Lair, Diego de Silva's story, is a political and psychological drama, investigating the difficulties of contemporary society for both the young and old participants. The two remaining stories both deal with show business and popular culture. Sandrone Dazieri's The Last Gag follows a fallen idol, a comic actor and alcoholic now running a nightclub, as he becomes an investigator on the trail of his former comedy partner's murderer. For a story rooted in comedy, Dazieri's tale is quite dour, but with a substantial plot twist at the end. Giorgio Faletti's The Guest of Honor begins with the comic banter of the first-person narrator, a tabloid journalist, but turns gradually darker as it investigates celebrity and identity through his pursuit of a vanished star. The collection as a whole benefits from De Cataldo's choice of fairly long an definitely substantial stories. While hardly a complete survey of Italian crime fiction, De Cataldo's choices provide enough of a survey to let us see what we're missing, as well as how some of the voices we know fit into the overall Italian crime scene. Crimini is a highly recommended and quite entertaining contribution to the current crop of anthologies (and to the pool of crime fiction translated into English, as a whole). Very interesting to read your review, as I was at their launch party last night, with Ms Euro Crime (Karen Meek). I was there under false pretences as Crime Scraps (Uriah) was invited but could not go, so he and Bitter Lemon kindly let me go instead. It was a fascinating evening, with Di Cataldo telling us about the gestation of the book, and then he and Frances Fyfield answering questions, plus film clips. Romanzo Criminali looked great, but unfortunately not available with English subtitles, and the book has no translation deal (at 600 pages, the economics of today's publishing do not allow it, says Di Cataldo). One question I wanted to ask but did not, was why is there no story by Gianrico Carofiglio in the book? Oh, the real reason for Carofiglio's absence in Crimini is very simple: when we decided to print the book, Carofiglio was still unknown! 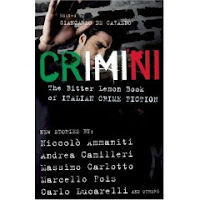 We are now preparing a new anthology, Italian Crimes, and Carofiglio is, obvioulsy, included. By the way, Gianrico Carofiglio will soon be elected in the Italian Parliament in the Democratic Party. Happy to know you appreciated Crimini!